Between 1974 and 1977, Harvard Six Cities Study researchers recruited residents who then completed questionnaires about their medical and occupational history, and underwent lung function (spirometry) tests. 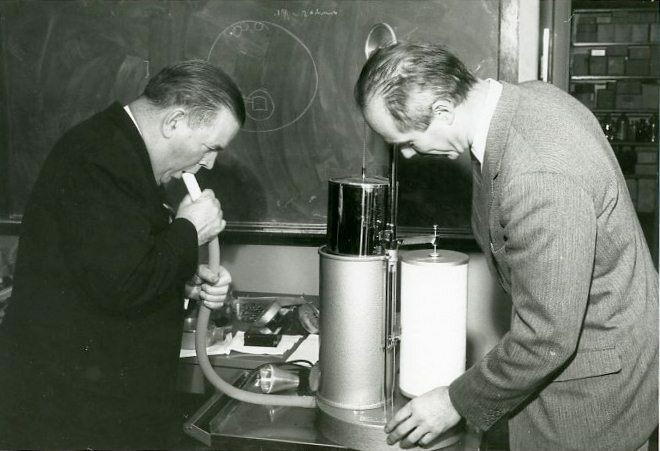 In this 1961 photo, a spirometer is demonstrated at the Harvard School of Public Health. Respiratory Health Effects of Respirable Particles and Sulfur Oxides, commonly called the Harvard Six Cities Study, followed the respiratory health and air pollution exposure of children and adults living in six US communities between 1975 and 1988 (Harriman, Tennessee; Portage, Wisconsin; St. Louis, Missouri; Steubenville, Ohio; Topeka, Kansas; and Watertown, Massachusetts). Techniques were advanced to understand indoor, outdoor, and personal exposure to particles, acid aerosol, acid gases, nitrogen dioxide, and ozone, among other contaminants. Sponsors of the study included the National Institute of Environmental Health Sciences, the Electric Power Research Institute, and the Environmental Protection Agency. The results were stunning. Residents of Steubenville—the city with the dirtiest air among the six studied—were 26% more likely to die almost two years earlier than citizens of Portage, which boasted the cleanest air. These results paved the way for the nation’s first-ever Clean Air Act regulations on particulate matter smaller than 2.5 microns in diameter—rules that are now responsible for adding years to thousands of lives. The historical narrative of the Six Cities Study has been relatively well-captured through numerous publications and Harvard T. H. Chan School of Public Health documentation; however, the long-term custody and preservation of the research data itself had yet to be addressed. In September 2016, archivists from the Center for the History of Medicine, Francis A. Countway Library, met with faculty and researchers involved in the study to establish a plan, and in December 2016, custody of the data was transferred to the Center. Over the following six months, this large collection was rehoused, box listed, and cataloged. 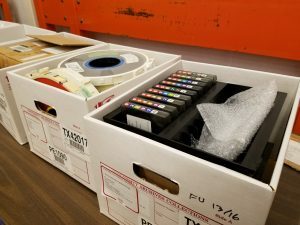 In addition to paper, Center staff discovered data in a variety of formats, including legacy media. Archivists also discovered photographs of researchers taking measurements in the field, background correspondence, and records relating to early precursor studies from one of the Harvard Six Cities Study’s early Principal Investigators, Benjamin Ferris. Legacy media from the Harvard Six Cities Study being reviewed by archivists in June 2017. In October 2017, after the physical transfer of the records had been completed, Center staff met again with faculty and researchers to better understand the types of data present in the collection and to determine how to facilitate future access. The group also discussed the various types of filters and media present in the collection to appraise their current research value. Future collaborations are anticipated to help celebrate this significant study and its continued impact and relevance in today’s political climate. The HOLLIS record relating to the Harvard Six Cities Study’s sponsored project administration records can be viewed here.The study’s original published findings (1993, NEJM) can be read online. ← Warren Museum Exhibition Gallery closed Memorial Day, May 28th.